It is a sad fact of life that many of the men who made the classic animated theatrical shorts during the Golden Age of Hollywood are largely unknown to the average person today. They have probably heard of Chuck Jones, the best known of Warner Brothers' animators, as well as William Hanna and Joseph Barbera, although they may associate their names more with television cartoons than the theatrical shorts they made at MGM. Among the names of animators of classic theatrical cartoons that the average person today might recognise is Bob Clampett. Even if they do not recognise him as the creator of Porky Pig and Tweety, they might well recognise him as the creator of Beany and Cecil. It was 100 years ago today that Bob Clampett was born. Bob Clampett was born in San Diego, California on 8 May 1913, although he spent most of his childhood in Hollywood. He was artistically inclined even as a child, displaying talent by the time he was five years old. As a child he was fascinated by comic strips and began drawing his favourite characters, such as Happy Hooligan, Jiggs and Maggie, and so on. He was also fascinated by films, eagerly going to see such greats as Lon Chaney, Charlie Chaplin, Douglas Fairbanks, Buater Keaton, and Harold Lloyd at the local cinema. He was only twelve years old when he had his first comic strip published in The Los Angeles Times. It was also when he was only twelve years old that he began making his own short films in his garage. He also had an interest in puppetry while young, creating his own hand puppets. It was in his childhood that he created a nondescript dinosaur that could be considered the prototype for Cecil the Seasick Sea Serpent. The comic strips by Bob Clampett published in The Los Angeles Times would draw attention. King Features offered him a contract for $75 a week. Given he was still in high school, he worked in their Los Angeles art department every Saturday. King Features also paid his tuition at the Otis Art Institute. Bob Clampett left high school just short of graduating in 1931. It was not long before leaving high school that Mr. Clampett would do his first job connected to an animation studio. Bob Clampett's aunt Charlotte Clark thought that a doll based on the cartoon character Mickey Mouse would sell very well. She then asked her nephew to go to the Alex Theatre in Glendale, California to watch Mickey Mouse cartoons and create sketches of the character. Mrs. Clark then created a pattern based on Bob Clampett's sketches. Charlotte Clark's Mickey Mouse dolls proved popular enough that she went to work creating dolls for Disney. Bob Clampett was then responsible for designing the first Mickey Mouse doll. For a time Mr. Clampett worked with his aunt at the Doll House, where the various Disney character dolls were created. It would also be in 1931 that Bob Clampett would begin his career as an animator. Having seen one of Mr. Clampett's 16mm films, producer Leon Schlesinger offered him a job at Harman-Ising Studios. Mr. Clampett's first job as an animator was animating secondary characters in the very first Merrie Melodie, "Play Your Mandolin! (1931). As a young animator at the studio, he worked primarily for Friz Freleng, who had already been in the animated industry for four years. Bob Clampett continued to work at Harman-Ising Studios until Leon Schlesinger broke ties with Hugh Harman and Rudy Ising to form his own Leon Schlesinger Productions in 1933. Bob Clampett was then employed by Leon Schlesinger Productions. Although it would evolve into the most famous studio in the field of animated shorts, Leon Schlesinger Productions got off to a rocky start. Hugh Harman and Rudy Ising had taken their popular character Bosko with them, and Bosko's replacement Buddy was not particularly popular. Observing the popularity of Hal Roach's "Our Gang" shorts, Leon Schlesinger suggested to director Friz Freleng do an animated take on the series. The end result was the short "I Haven't Got a Hat", for which Bob Clampett contributed a minor character in the form of a short, stuttering pig named Porky. While the other characters in "I Haven't Got a Hat" fell by the wayside, Porky proved to be Leon Schlesinger Productions' first hit character. By 1936 Bob Clampett would be promoted to director, with his first animated short in that position being "Porky's Badtime Story" (1937). For the most part Mr. Clampett had total creative control over his shorts. That having been said, on average he had only four weeks to complete his shorts and $3000 to spend on them. Regardless, Bob Clampett's shorts proved very popular. When Tex Avery abruptly left Leon Schlesinger Productions in 1941, Bob Clampett took over his position as head of Mr. Avery's animation unit. It was in 1942 that Bob Clampett created Tweety, introduced in the short "A Tale of Two Kitties". Bob Clampett remained with the animation unit after Leon Schlesinger sold it to Warner Brothers in 1944. It was in 1946 that Bob Clampett left Warner Bros. Cartoons. For a time after he left Warner Bros. Cartoons, Mr. Clampett worked for Columbia's animation department (then called "Screen Gems", the same name they would later use for their television division). as a gag writer and screenwriter. It was only two years after he left Warner Brothers that he received an offer from Republic Pictures to head their new new animation division. He was promised total creative control. Unfortunately, Bob Clampett was only able to finish one cartoon, "It's a Grand Old Nag," before Republic decided that they did not want to make cartoons. While Bob Clampett's experience with Republic was a bit of a setback, it would not be long before he would go onto one of his greatest claims to fame. In 1949 he created the television puppet show Time for Beany. The series centred on a boy named Beany (who wore a beanie), his friend Cecil the Seasick Sea Serpent, and his uncle Captain Horatio Huffenpuff. Together Beany and Captain Huffenpuff travelled about the ship Leakin' Lena to strange places, accompanied by Cecil, and at times ran afoul of the villain Dishonest John (who even had a handle bar moustache and cape so everyone knew he was the villain). Time for Beany first aired locally on KTLA in Los Angeles before being transmitted nationally by the short lived Paramount Television Network. While on the surface Time for Beany might appear to be a children's show, in truth it was a sophisticated show that combined lampoons of current events and pop culture with topical references,Shakespearean asides, puns, and slapstick comedy. Among its fans numbered Albert Einstein, both Groucho and Harpo Marx, and a young Frank Zappa. In 1950, 1951, and 1953 Time for Beany won the Emmy for Best Children's Programme. Debuting on 28 February 1949, it ran until 15 July 1955. Bob Clampett also did other work in television. He created the television puppet series Thunderbolt the Wondercolt that ran in 1952, as well as the puppet shows Willy the Wolf and Buffalo Billy (both in 1954). None of them saw the success of Time for Beany, so it would come as no surprise when after a few years Time for Beany was revived in animated form as Beany and Cecil. Matty's Funday Funnies originally showed 1950-59 Famous Studios theatrical animated shorts starring such characters as Caspar the Friendly Ghost and Little Audrey. This ended when on 6 January 1962 the show became Matty's Funnies with Beany and Cecil, airing Bob Clampett's cartoons based on his old puppet show. It was only three months before the show's title was shortened to simply Beany and Cecil. The show continued to run in prime time at 7:00 Eastern/6:00 Central on Saturday night until 29 December 1962 and then continued to run at other times of day until 30 June 1962. Starting in 1963 Beany and Cecil would be rerun first on Saturday morning and then on Sunday morning until 1967. Beany and Cecil lacked the political satire and references to current events that Time for Beany had, but it was still very much a show that could appeal to adults. The animated series retained the lampoons of pop culture, puns, and slapstick comedy. Indeed, in one of the best known Beany and Cecil episodes, "Beanyland," Bob Clampett parodied Disneyland, making ABC very nervous in the process. Throughout its run Beany and Cecil spoofed such things as beatniks, Davy Crockett (yet another swipe at Disney), the Rat Pack, physical fitness, rock 'n' roll, and even television itself. Bob Clampett would spend his later years speaking at animation conventions and college campuses, discussing his time at Warner Brothers and Beany and Cecil. He died of a heart attack on 2 May 1984 at age of 70. He had been touring the country promoting the release of Beany and Cecil on VHS. There can be no doubt that Bob Clampett was one of the greatest animators of all time. 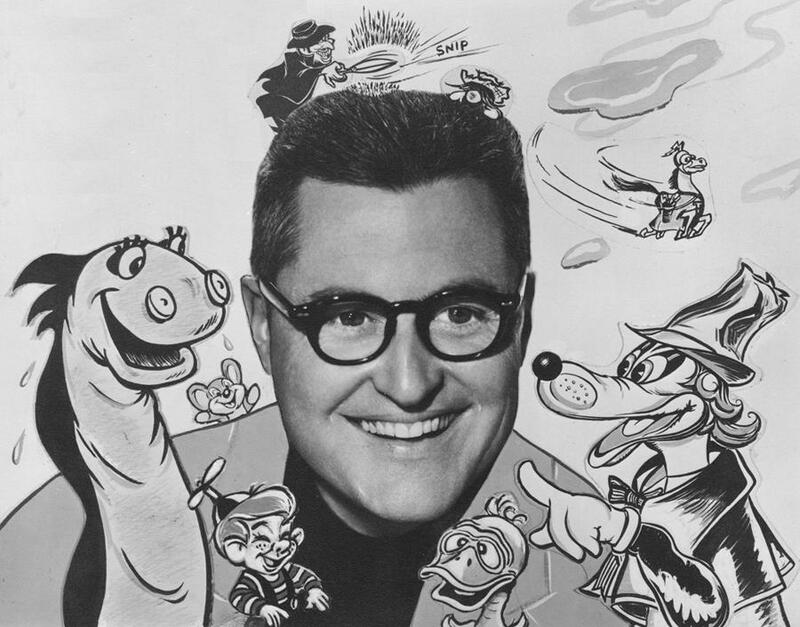 It was Tex Avery who introduced the manic approach filled with sight gags, sarcastic wit, and pop culture references for which Warner Brothers would become known. Working within this approach Bob Clampett went even further. Influenced by artist Salvador Dali, Bob Clampett made animated shorts that can only be described as surreal. The laws of physics had no place in the majority of Mr. Clampett's cartoons, and his characters were fluid beyond belief. Among his earliest successes in surrealism was "Porky in Wackyland" (1938), in which Porky visits Wackyland where, according to its sign, "It Can Happen Here!" In Wackyland logic has no place and Porky sees such sights as a creature that plays "The William Tell Overture" through his nose, a criminal imprisoned by no more than a set of bars floating in mid-air, a duck singing "Mammy," and other strange sights. Bob Clampett's tendency towards surrealism would remain a part of his style as long as he worked at Warner Brothers, and can be seen in such cartoons as "Nutty News" (1942), "The Great Piggy Bank Robbery" (1945), and "The Big Snooze" (1946). If Tex Avery and the other animators at Warner Brothers ignored the logic and laws of physics of the real world, Bob Clampett smashed them entirely. Not only were Bob Clampett's cartoons characterised by surrealism, but even before the puppet show Time for Beany his work was characterised by references to American pop culture and parody thereof. This can be seen as early as 1940, with the short "Africa Squeaks", essentially a parody of the film Stanley and Livingstone (1939). Even when Mr. Clampett was not parodying a specific film or radio show, he would often include some pop culture reference in his animated shorts. "A Tale of Two Kitties" not only features a pair of cats who are clearly based on Abbot and Costello (Babbit and Catstello), but takes a direct swipe at the Hays Office (which oddly enough remained uncensored at the time). Of course, if anything Bob Clampett's tendency to reference and parody American pop culture would become even more pronounced with Time for Beany. Bob Clampett would have a lasting impact on animation and American entertainment media in general. While Tex Avery started the move away from the Disneyesque animation of the early shorts at Leon Schlesinger with his high energy, non-stop gags and action, Bob Clampett completed the move away from Disneyesque animation with surrealism and a complete disregard for the law of physics or real life logic. Between Messrs. Avery and Clampett, they arguably created what we know as the Warner Brothers Cartoon. The awareness of American pop culture Bob Clampett showed in his Warner Brothers cartoons and later in Time for Beany and Beany and Cecil was arguably ahead of its time. While today such pop culture references are common place, this was not the case in the Forties and Fifties. In that respect Bob Clampett can be seen as the harbinger of everything from the Sixties comedy The Monkees to the modern day sitcom Community. Bob Clampett was a one of a kind talent whose work remains immediately recognisable and whose influence can still be felt today.